If you're wondering how social media might help you change the world by spreading the word about your cause or the brand(s) you represent, I am sure you've seen Malcolm Gladwell's article Small Change: Why the revolution will not be tweeted in the New Yorker and, more importantly, the barrage of responses to the article. If you read the article, which I think you should, you know that Mr. Gladwell posits that social media's potential to incite social change is overblown by its advocates and promoters. I decided to wait a week to see what would be written in response to this apparently drastic supposition before wading in and adding my own voice to the conversation (image from Donklephant). Look, I'm not trying to be flip (well, maybe a little), I'm pointing out that this opinion by itself doesn't matter that much. The thoughts it's provoked and the conversations that ensue are what's important because it's about what social media can and cannot do (We won't really know for a while anyway). Mentioning that the "next big thing" may not be all its cracked up to be might raise some good questions about its potential, and avert a headlong rush into a gleaming over-promised future. Whether or not social media sharing will help change the world (and here we need to ask the question, what does "change the world" mean and whom will benefit from the change?) it presents a new way to connect and spread ideas. This is why online social networks matter. Sure, as Mr, Gladwell points out, activities like clicking 350.org's "like" button on Facebook or buying a pair of "green" shoes online in support of their 10/10/10 Day of Climate Action is easy, and calling it "climate change activism" might be overblown. But it is action. Maybe that Facebook "like" or that 350.org purchase will lead to the next step of active engagement. Maybe not, and that doesn't mean they're meaningless acts (though the cynic in me might think otherwise). Using social media tools for your cause depends primarily upon whether the people interested in the topics you're seeking to affect, change, contribute to, infiltrate, etc. are there. If they are, why wouldn't you want to be? Would many of the connections be lost? Yes. Would some stay on? Yes. Is digital activism an effective medium for change? 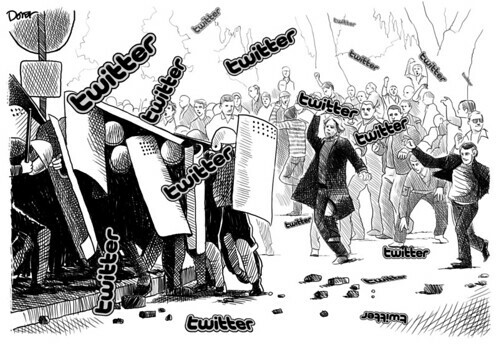 Will social media take us to the barricades?